Eddie just finished a very large project for school. His assignment was to learn about and write about any breed of dog that he chose. Of course, Eddie chose our beloved pug. Each night for the past two weeks, Eddie had to spend time reading pug books from the library. 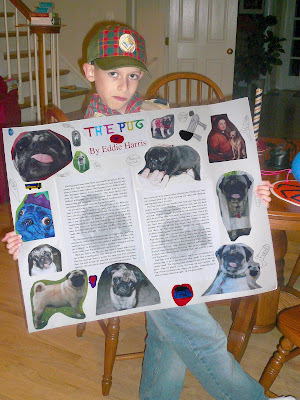 The, he had to write at least one page about the pug breed and decorate a large poster board with photographs of pugs. 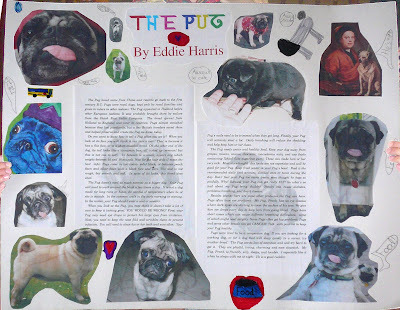 Eddie had no problem finding lots to write about on pugs. It's one of his favorite topics! This is probably some of the best writing he's done to date. Nice job Eddie! Frank is very handsome. You picked the best shots of him. Hugs! What a great poster Eddie! You did such a nice job writing about pugs. It's easy to see that you love your PUG by reading the report that you wrote. It was very interesting to read.